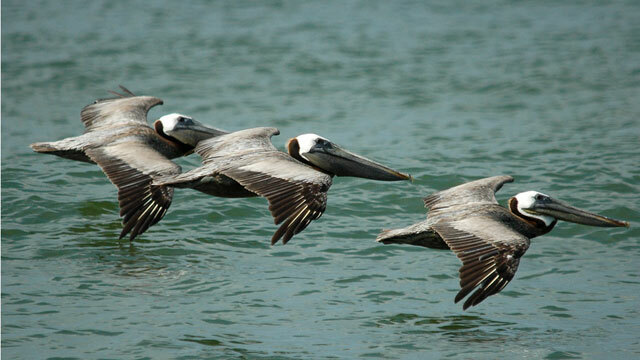 California brown pelicans, which were driven to the brink of extinction in the last century, are in trouble again. The survey in Mexico's Gulf of California — where about 90 percent of the pelicans typically breed and raise their chicks — found that areas that typically host hundreds or thousands of nesting pairs held far fewer, and a few places were completely empty, the statement said. "That's what we call a failure, a bust. The bottom dropped out," said Dan Anderson, a wildlife biologist and UC Davis professor emeritus who conducted the survey along with members of Mexico's National Commission of Natural Protected Areas. The bird's range extends from Mexico to Canada, according to the National Park Service. Breeding population crashes of the pelicans often are associated with a warming of the central Pacific Ocean, known as El Niño, but that isn't expected to begin until this summer and the drop also was much steeper. "During most El Niño events we've seen, numbers of nesting attempts drop by at least half to two-thirds, and production goes down, too," Anderson said, according to the UC Davis statement. "But it drops from thousands to hundreds, not to 10 or less." The California brown pelican was declared an endangered species in 1970 after its population was pushed to the brink of extinction by the pesticide DDT, which caused the bird's eggshells to become so thin that they broke. After DDT was outlawed, the bird made a recovery and was taken off the list in 2009, when the West Coast population was 150,000.